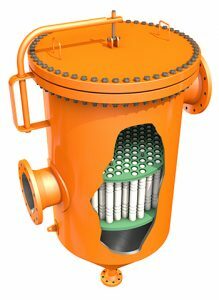 SWECO Hydrocyclone Systems provide an economical and effective method for removing solid particles in the 4 to 100+ micron range from various slurries. Hydrocyclones typically make finer separations than are practical with screening separators and at significantly higher capacities. In many applications cyclones can be used in place of decanter centrifuges, providing the desired result at lower cost. Hydrocyclones are supplied in either an open-manifold or a Packed-Vessel configuration. Manifolds (radial or linear orientation) utilize 2-, 4-, 5-, or 10-inch diameter cyclones while Packed Vessels contain either 1- or 2-inch diameter cyclones. Both configurations can process feed rates from 10 to 3,000 gallons per minute, depending on the size and number of hydrocyclones installed in the system.